Check with your local permit office about how close you can be to the leach field with the pool. There is often a minimum setback from a septic system. Also consider how you will run conduit for your electrical service out to the pool. Another thing you may want to plan for is placement of a deck around the pool if you think you may want one and how the septic system might impact its placement. Often you want a deck on the sunny side of the pool. As for building the base up that's really not the best way to go if you can help it. It would be better to dig down to make a level spot for the pool and install a tile or french drain to help that area shed the excess water in the spring. Even if you were to build up a base it would still be best to fix the drainage issue in that area of the yard rather then count on the built up base to hold up the pool. A 15' diameter pool will weigh about 45,000lbs when full with a bearing pressure of 255 pounds per square foot. You don't want to put that kind of weight on ground you think is soft. You can do what I did, just don't tell anybody here! Most will advise against it, but I'm going on year 6 with no problems. Dimension at the ground for Intex 16' Ultra frame pool. It's not that the sand box idea doesn't work .... That's actually how mine is built if you look at the photos of my build you can see I raised the down hill slope the height of a 6x6 with road base material that was mechanically compacted. I had to deal with some small house sized rocks I couldn't move to dig down to level. The thing that makes this build different is that Nick wants to put the pool in a low spot in the yard that collects water and is by his own admission soft ground. There are more issues to consider than just making the ground level like you and I did. Another idea he could consider is to dig down to level and do a partial bury of the pool. That would allow him to re-grade the property so that the land sloped away from the pool preventing the water from building in that area. Again there are issues with the septic field being in that area. Thanks for info and opinions thus far. My septic runs would end about 30' from the base of the pool. Also I will be running electrical from the garage which is to the left of the photo. 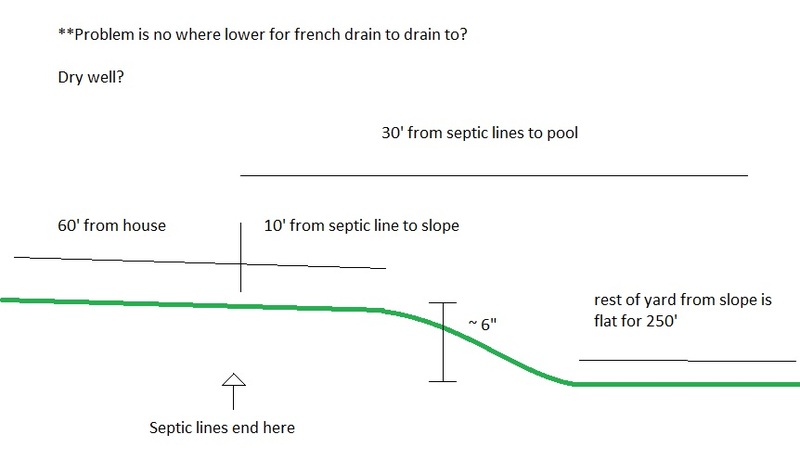 I will have to read up on french drains, I have always had a hard time figuring out how exactly tile systems worked! 30 feet should be more than enough setback. It never hurts to check with the local permit office to make sure tho. Doing a partial bury on the pool and re-grading around it to stop the water solves a lot of your issues without much fuss. It would probably be the cheapest option at the end of the day as well. Having water collect at the base of the pool is a recipe for disaster. Here is a bit more info. A french drain would be nice but my yard is flat and slightly lower than all of the neighbors (except the one to the left who is the same height as ours). I wonder if a french drain around the pool connecting to a dry well buried lower than the drain say 20' away from the pool? Remove sod, level. sand, pool. I just don't want water to pool around the pool. I don't foresee the ground sinking or anything like that. Its hard to tell if a dry well would have enough capacity to really be effective. If you could find the perk test data and soil logs from your septic system you might have an idea about how fast the subsoil drains water. I think you had the right idea to start with, to make the pool an island in the yard. Instead of raising the pool up you can raise the yard up around the pool to keep the surface water away from the pool. A lot of AG pools will allow up to 2 feet of back fill against the walls. You could easily slope the ground away from the pool and force the water to settle away from the pool. You have a tough problem here. Even if you were going to build up the yard with some material that you could adequately compact you are placing the material over the neighborhood low spot which is apparently somewhat spongy. If the budget was unlimited you could dig out a certain amount of that material, create a stable base with imported material and build back up in lifts with stable material. I've seen that done on here for gunite pools. I somehow doubt you want to pay the cost for that. So I'm coming round to CJ's idea build a soil donut and place the pool in the center. If you do it right it will look great. Thanks folks, still thinking about things. Below are a few pictures I took just yesterday. My yard is 100' wide and goes to the back of the tree line in the pictures. I was standing about 30' behind the garage when I took the pictures. 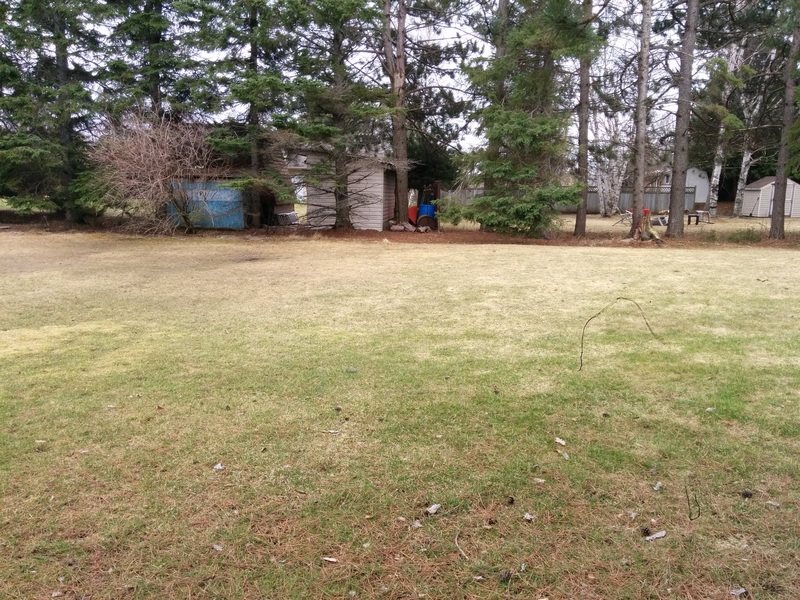 The fence is along the left side of the yard and the last picture is along the right side of the yard. You can see how wet it is right now in the first picture. 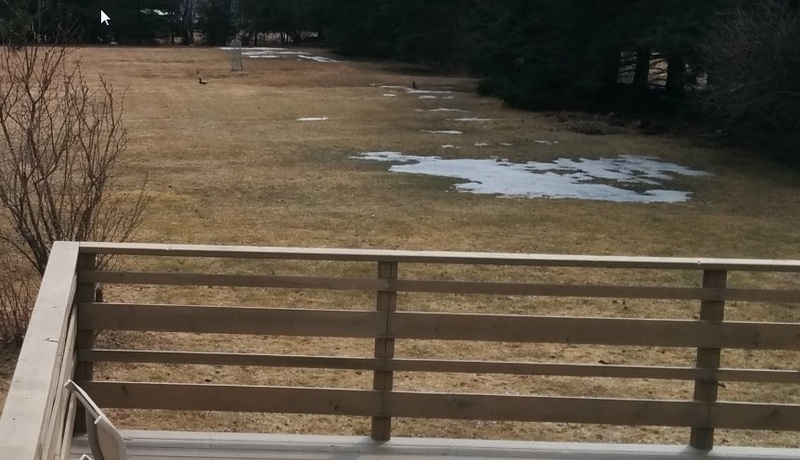 Now, I was thinking how much better this site is in the summer. Last year we had our wedding in our back yard and had a 60'x80' tent erected filled with tables and chairs. It rained the 2 days before the wedding and there was no issue the day of the wedding with soft or soggy ground. Plastic patio chairs didn't sink in the ground either. 1. Remove sod in an 18' diameter circle. 2. Depending on soil underneath may excavate a further 6". 3. Fill with 'granular A' gravel in 6" lifts, using a vibratory plate compactor to compact. 4. Build up a base to sit 6" or so above grade. 5. Slope edges and sod. 6. Dig trench 1' out from edges of pool foundation, put in french drain, connect and run further back in yard to 10 gallon dry well. Its better to prevent the water from getting to the pool than to carry it away once it's there. It's always better to dig down to level and put the pool on virgin ground. Any who, you seem to like the idea of raising the pool. So I will try and give advice to that end. I'm no expert by any means and I maintain that putting a pool up on fill is something you do at your own risk. You can see some photos of what I did in the link in my signature if you haven't already. Pretty much the basic starting step no matter which way you are going. I would dig down to make the site level and on firm soil no further. Not sure what "granular A" is. The fill I would use I generally hear it called "road base", "quarry process", and "inch and a quarter minus." You want material that has virtually every size rock from stone dust all the way to 1.25-2" rock. It should have no organic material at all. You should do fill lifts based on the capability of your compactor. Best bet is no lifts greater than 4 inches. The fill must have enough moisture in it to achieve greater than 95% compaction. This will vary based on the fill you are using. Ask the company supplying the fill how much moisture they recommend. I wouldn't go any higher than that. At this point you are talking about potentially 12inches of fill in spots that is getting very deep. The yards of fill you need add up quickly. In my area a full tri-axle delivery of 20 tons was about 400. I needed two loads for my lift, which tapered from 6 inches deep to nothing on the high side. Because you know you will have water runoff into the area I would put some sort of retention edging on your fill to keep it in place rather than sloped edges. Sod doesn't stop erosion its only slows it down. A drain for the water is a great idea but I have no idea how big a dry well you would need 10 gallons sounds very small if you get a standing puddle in the spring. You need to design your site for the worst conditions in all the seasons. Since the pool stays full all year your base needs to stay stable all year long too. Every major rain I get I still go out and check for signs of undercutting and erosion in my base material because of how my pool is installed. All it takes is one support to get undermined for the pool wall or liner to fail. Thanks for replying. The only reason I am weary about digging down to level virgin ground and installing the pool there, is I feel it would be bad for the pool to sit below grade. It is nice and hard and dry in the summer / fall but spring it is very wet. Wouldn't it be worse if I removed the sod and put the pool down on this ground? Seems like I would be making a hole and asking for water to pool all around the pool? By the looks of your lawn you won't have to go very far under the sod to make a level site for your pool. So the base of your pool won't be that far below the sod as it is. If you re-grade your lawn so that the soil is high around the pool and you make a new low spot in the yard water will go to that low spot and not saturate the ground around your pool. You would have to re grade a pretty large are like twice the diameter of the pool to really make that work well. If you give the water a new low spot to settle and a way to get there it will leave your pool alone. You will probably need to bring in some top soil or fill to do some of the re grading of the land but you can take some material from your new low spot to help raise the are around the pool. Both solutions will cost you extra to do but to me it seems like the better long term solution is to make a new spot for the water to go and burry the pool a little bit than to try and raise the pool above the water. At the end of the day the extra material to get the pool where I put it cost me between 2-4k. I did all the work myself so I didn't pay anyone for labor. I was dead set on making the pool work and the extra cost it took to make it happen was worth every penny. 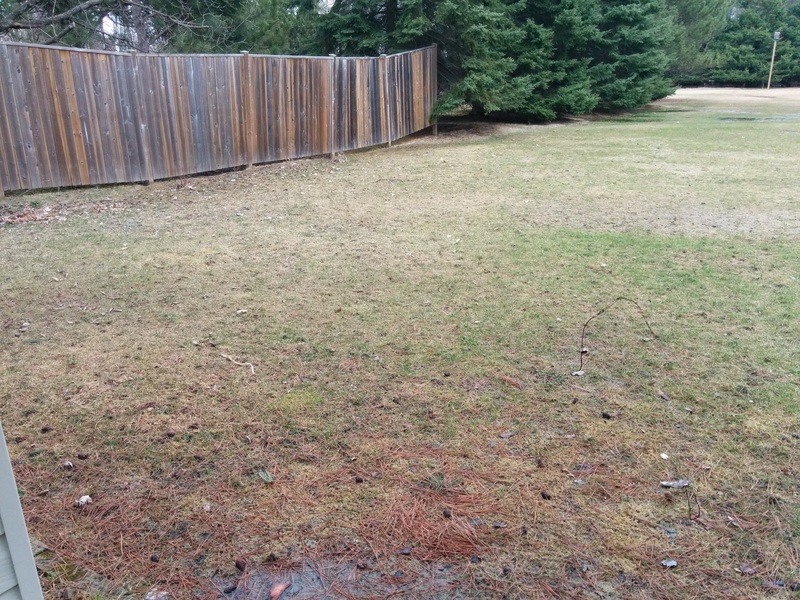 The pool will be at the bottom of a swale with everyone else's water running into your yard in that spot. You need to keep that water away from the pool. Putting it in a donut would allow the water to flow around the pool. I would dig down to level and not build up. Cool, if digging down to level won't create a moat around my pool, the extra effort to build it up would be better spent trying to re-work the yard. We are getting a resin pool (we love saltwater) so I hope this will be OK with some dirt bermed around the based. The instructions for the pool will specifically state if it is ok to back fill against the pool and how high you can back fill. Too bad you already ordered the pool because I would have advised you to try a cheap Intex at that size and just see how things go. You can set it up right on the grass (if level) and other than the legs I doubt water puddling will do much harm in the few years it would last anyway. Then you will be ready to do the work for an upgraded (and probably larger diameter) pool. Intex and their knock-offs are great "learner" pools and pretty forgiving of incomplete planning (we call that ranch-rigging around here LOL) Any upgrades you might want to do to the Intex, such as pump, filters, ladders, and skimmers can be switched to the better pool when you are ready. Pv2, that is a fair comment but I would rather just try and do it right off the bat. That's why I am here, to find out the best way to handle the situation I have been given. I just don't understand why the rear is so wet. We are 550' from a 100' high bank that goes down to a large river. The area is fairly sandy, no clay. 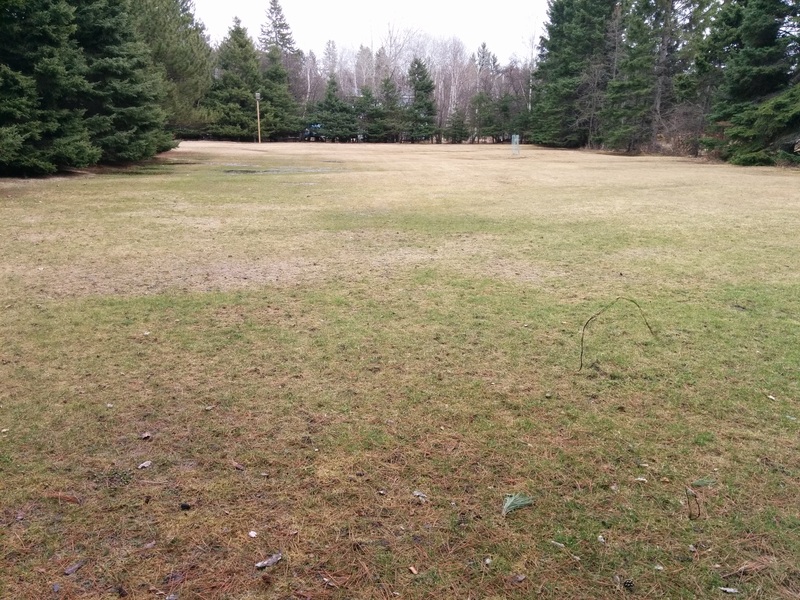 Even though our yard is lower than neighbors, I would have through drainage would be excellent due to the sandy soil and proximity to 100' drop to river. Surface water does tricky things and there may be a semi impermeable layer of soil between the top soil and the sand layer which makes the water collect on top. Just like a sand filter the top layer of sand will get so full of particles from the top soil that water will stop flowing through it. The soil logs from your septic plans would have that information. The leach field needs to be placed deep enough to avoid layers like that or to work in a permeable band in between two impermeable layers. Fixing the surface grading like we've talked about should give you a nice dry and stable site to work with. Thanks CJ. I am going to have a look at my septic permit (from 1975) to see if it has that information on it. I hope my drainage issues can be as easily resolved as I am hoping by your advice. EXCITED!!!! BUILDING IN GROUND POOL! !